Lanzarote - Rec Tech Dive Team. 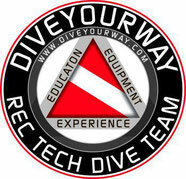 DIVEYOURWAY. Lanzarote, is one of the seven Canary Islands, located in the far North of the Archipelago. Geographically belonging to Africa, the Canaries are a remote part of Spain, just 120 km off the African coast. Due to its privileged climatic conditions with moderate air and water temperatures, the island of Lanzarote is an all year round holiday destination. The excellent quality of its waters and the beauty of the well maintained beaches offer great opportunities for excellent diving and snorkeling, any kind of other watersports, sunbathing and chilling out on the beach. The fact that fishing has been restricted to very limited areas around the island, Lanzarote has become a real divers paradise during the last couple of years. You will find perfect conditions for great diving combined with relaxed or exciting family holidays. The image of Lanzarote is mainly influenced by two factors: on the one hand its volcanic origin which is impressively shown in Timanfaya National Park, also called the fire mountains, which have been declared Biosphere Reserve by UNESCO in 1994. 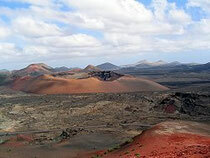 The fire mountains are a must on your sightseeing schedule for your Lanzarote holidays. The second important factor is the influence of Cesar Manrique, the famous Spanish artist, architect, sculptor and environmentalist (*24.04.1919, † 25.09.1992) who is responsible for the mass tourism on Lanzarote being held within certain limits. His work focused on preserving Lanzarotes cultural and scenic identity and he understood his art as a close harmonic link between the human being and nature. An outstanding example for this philosophy can be seen in his former house which now hosts his own foundation “Fundación César Manrique”, as well as in the caves of “Jameos del Agua”.